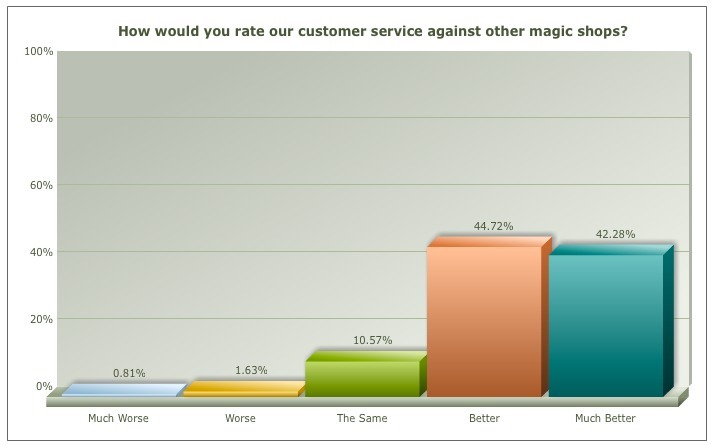 Customer Feedback about the service at The Merchant of Magic. Please feed free to leave us a review on this page. 'DUDE you actually replied that fast??? Where has this website been all my life! 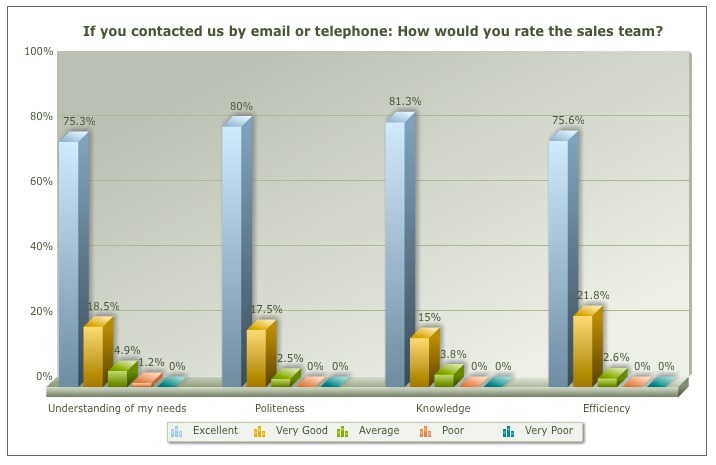 Sample size: 1531 customers that had recently placed an order responded. 'Can I just say how much of a pleasure it is dealing with The Merchant of Magic! I get things from a couple of UK magic shops, but now I'd say 80% of all my magic shopping is done through you guys, simply because the service is impeccable! The website is so simple to use, delivery is speedy and any time I've phoned up, I've had fantastic advice given to me and a really personable service over the phone. It's things like this that keep me coming back and spending more money! 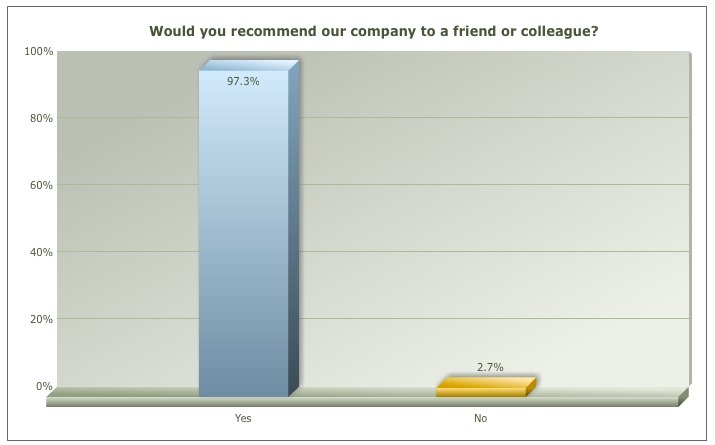 'Hi Guys, I just wanted to say a huge thank you for your expert service. I have emailed you before and brought many magic tricks from you, but never phoned before. I called today to ask about the M5 pk set, and also the spider pen. I'm sorry, I can not remember the name of the person I spoke to, but he was brilliant, very helpful and gave fantastic advice. 'Nice work! I recently bought a few of your card magic tricks as a Christmas present for my boyfriend. Thank you Mark & Dominic for your excellent & professional approach to not only taking my order but answering all my questions prior to placing the order. I rate you an 11 outta 10! I am touring in Europe and delighted that although you mailed it on Friday it arrived early on Tuesday. And not only that, securely packaged too! Wonderful in this day and age to deal with someone who is efficient, helpful & 100% professional. Delighted to recommend yourselves to other Pro performers. Sincerely - . I have been using Merchant of Magic now as a educational and trick resource for a few months. They are very refreshing to work with. They have one of the widest inventories I have seen. I love their willingness to share lots of important strategies and wisdom to help me better master magic in my Business Coaching and Consulting practice. I use it to help provide a new awareness and re-enforce concepts to my clients. Thanks Dominic and crew. Thank you so much for your amazing help and OCL is very appreciated. Amazing customer service as always. This is exactly why you are my main supplier for magic products. You're my #1 place to shop for magic supplies and you deserve to be #1 for the whole country. I would just like to quickly say thank you for the fast delivery and all the help you have given to me ever since I first ordered those deck of cards. I am a beginner magician and I find your help and advice very helpful. This is the first business that I know of that is consistently helping their customers, even if they do not have to. And I would just like to say that what you are doing is amazing and has really pushed me forward in my love for magic. Thank you ever so much for your help, best customer service I think I’ve ever received! 10 out of 10 for a first class customer service.